Anna The Red was born in Japan and moved to the U.S. in 1994. Anna The Red creates wonderful edible food bentos called “Kyaraben” or “Charaben” (character bento). Anna The Red first started composing bentos for her boyfriend. Her works have received notorious status in the sub-culture bento world and have gained much media attention. Her bentos are very nerdy/geeky and absolutely awe inspiring! Lia Chen is a mother of two in Jakarta, Indonesia who loves everything bento. Although she claims not to be an expert in cooking, her kid friendly healthy lunches prove otherwise. Lia loves to learn new bento techniques while expanding her bento collection. Sheri Chen makes bentos for her two children so they can learn that it is fun and exciting to eat healthy and nutritious meals. She lives int the San Francisco Bay Area, CA and operates under the avatar sherimiya on her flickr site. Her bentos are very colorful and detail oriented. If I was a kid it would be very hard not to smile at the extreme cuteness of her bentos. It is very obvious that a lot of love goes into each bento! 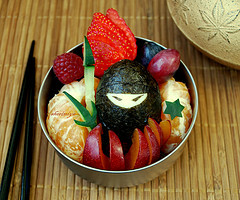 Just Bento is probably one of the most comprehensive bento sites on the web at this time. It is owned and operated by Japanese born Makiko Itoh. She has lived and traveled all over the world and currently divides her time between the Zürich and southern France. She is very passionate about sharing her traditional Japanese cuisine and helping people discover the wonderful simplicity of simple and easy to prepare foods. Her website has a particular flare with using bentos as a tool for managing one's weight and creating a health conscious culture. Just Bento is the sister site of Just Hungry. Lunch in a box is run by super bento packer Biggie. She is a work-at-home mom of a four-year-old in San Francisco. There is no doubt that she is obsessed with cooking and building a faster, better packed bento lunch. Biggie lived in Japan for nine years and is fluent in Japanese. She loves cooking all cuisines and she is eager to experiment with new things. 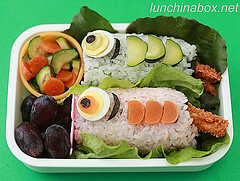 Lunch in a Box is another extremely comprehensive bento website that will make getting started on bentos fast and fun. She has a great FAQ section and a bento store locater! Susan Yuen is the mother of two wonderful children, Paige and Sean. Before she became a stay-at-home mom with the birth of her first child, Paige, She worked as a sous chef for Polomin Euro Bistro and later Kincaid's. . She started making bento's when Paige started school to provide her with healthy and fun meals that would also function as a creative outlet for the stay-at-home mom. In 2008 Susan wrote Hawai`i’s Bento Box Cookbook, Fun Lunches for Kids and in April 2010 she debuted her second book, Hawai`i’s Bento Box Cookbook, 2nd Course. Her Bento's are extremely adorable and well rounded for her growing children. I must mention that she has one of the largest bento collections I have seen and I’m completely envious! Bento zen was created and maintained by a Manhattan lawyer who works in a chaotic and often stressful environment. She believes that by taking the time to prepare healthy, colorful, and artistic lunch boxes, she guarantees herself at least one moment of harmony during her busy work day. Abento is a 30 year old mom of two living in Honolulu, Hawaii. In 2007, she lost 22 pounds on Weight Watchers while doing her bento blog. She was born and raised in the small town of Hilo,Hawaii. Abento decided to use bentos to regulate her portions to help with weight loss. It worked! 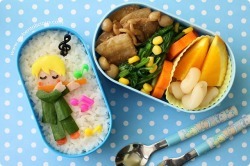 Her bento's are vivid and cute and has themes running throughout. 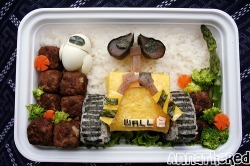 She does hilarious and very detailed bentos based on the T.V. show lost! There are so many more bento box heroines and heros that I have not the time or space to mention here. There is a growing bento subculture around the world that many bento bloggers have already explored in its vast reaches. Instead of dupilcating their already detailed excavation of archives I will just link to the particularly detailed sites. Happy Bento Hunting!